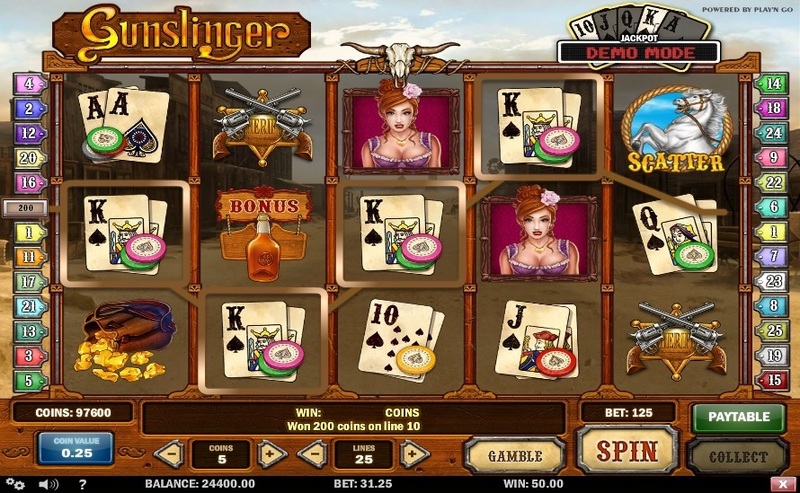 Gunslinger, a Play N Go online video slot based on the Wild West theme, comes with plenty of bonus features and a top jackpot of 10,000 coins for a combination of five Cowboy wild symbols. Gunslinger is based on standard slots rules. To play for real money, players will have to place a real money bet and hit the spin button. They will get paid if a winning combination of symbols is displayed on the reels at the end of one spin. If no winning combination is displayed, players can place another bet and try again. Gunslinger comes with 25 paylines, a coin value range of $0.01 to $0.25, and a top bet of 5 coins per activated payline. This means that players can bet a minimum of $0.01 to a maximum of $31.25 per game. If players want to bet maximum, they just have to click on the Bet Max option. Players can also customize their gambling experience by altering game settings, turning the sound effects on/off, and using the Autoplay feature. Since the slot is based on the Wild West theme, its reels are populated with symbols one usually sees in Wild West movies. There are high-value playing cards, cowboys, sacks of gold, and other thematic icons. Whenever players create a winning combination with the high-value card symbols, the amount of cash in the jackpot that is located above the reels will increase. When players have created winning combinations with all the card icons, they will be prompted to play a simple game, in which they will have to turn over the face-down cards to reveal cash prizes. If players get five Sheriff’s badges while turning over the cards, they will win the jackpot. The appearance of at least three Whiskey Bottle symbols on the reels will activate the free spins bonus round, in which all wins will be doubled before being credited to players’ accounts. Players can re-activate this feature by landing three more Whiskey Bottle symbols. This time, however, they have to shoot one of the bottles to get the number of free spins. The Bounty Hunt Bonus Game gets activated by the appearance of at least three Wanted Poster symbols on an activated line. The game challenges players to shoot barrels to get prizes and to guess their opponent’s move to win a multiplier value for those prizes. There is also an optional gamble game, which gets activated whenever players hit a winning combination. Players can either double or quadruple their winnings in this feature. Gunslinger has an impressive soundtrack, plenty of bonus features, and the ability to retain players for hours. If players love the Wild West theme, this is one slot they will surely want to try. The game is available at any casino that offers PlayNGo games.